The Liars Club: Now This Is Funny! 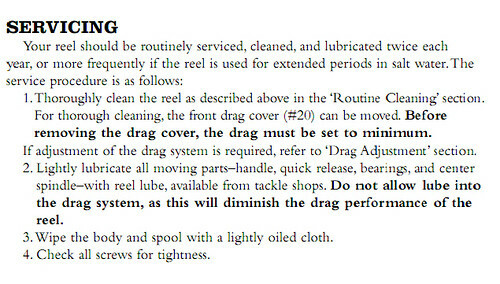 Always make sure you follow the manufacturer's instructions for cleaning and lubing your reels. For many of us, the fishing season never ends, but for those who do put away some of their equipment—dry-fly rods, the 2-weight you use for native brookies, etc.—for the long winter, storage is important. Although most fishing gear will last for years if you treat it right, incorrect storage can shorten that life span or ruin the aesthetics of a fine rod or reel. For instance, C. Boyd Pfeiffer, the godfather of tackle craft, tells of how he put a fly rod away wet, and when he retrieved it in the spring it was covered by tiny white blisters under the finish. Here are some tips to help you avoid such an unwelcome surprise.1. The end of the season is the perfect time to clean all your gear. Before you store rods, reels, waders, and lines, you should wash them and allow them to completely dry. Rods: An old toothbrush is perfect for lightly scrubbing around the hardware and guides. Pfeiffer notes that taking several rods into the shower with you is a convenient way to get the job done quickly. Make sure you rinse the rods thoroughly and allow them to air dry. Reels: You can use the same toothbrush for getting all sand, salt, and grime off your reels. Take the lines off all reel before you wash them (although you can leave the backing on). Again make sure you rinse all parts thoroughly and put them on a towel to dry. When one side is completely dry, flip the parts over, so any water hiding in nooks and crannies can run out. Do this a few times. Fly lines: Always follow the manufacturer’s instructions for cleaning your lines. Using dish soap will actually remove the slick coating. A moist rag will usually do the trick. Guide Joe Demalderis says that, if your don't want to take the lines off the reels, leave your line attached to the spool and lightly coil the line around a large coffee can. Then toss the reel or spool into the can and snap the plastic lid on over the backing. The tension from the lid doesn't hurt the backing. Now your lines are stored in a less-memory-setting situation and your reels or spools are protected from dust and grime.